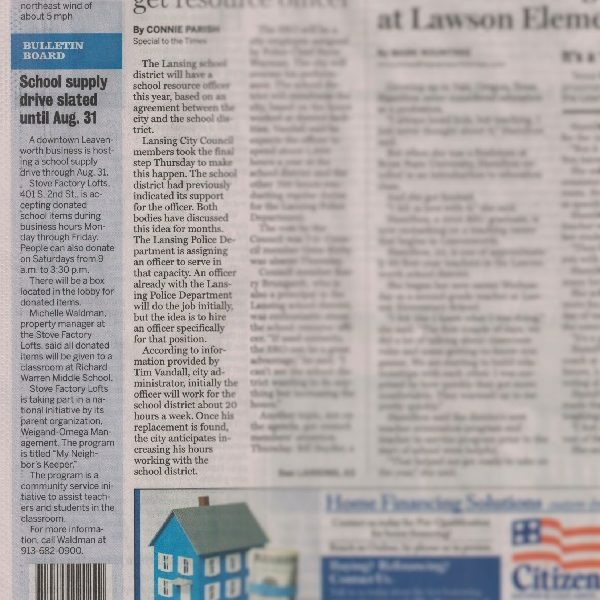 “A downtown Leavenworth business is hosting a school supply drive through Aug. 31. Stove Factory Lofts, 401 S. 2nd St., is accepting donated school items during business hours Monday through Friday. People can also donate on Saturdays from 9 am to 3:30 pm. There will be a box located in the lobby for donated items. Michelle Waldman, property manager at the Stove Factory Lofts, said all donated items will be given to a classroom at Richard Warren Middle School. Stove Factory Lofts is taking part in a national initiative by its parent organization, WEigand-Omega Management. The program is titled, “My Neighbor’s Keeper.” The program is a community service initiative to assist students in the classroom. For more information, call Waldman at 913-682-0900.